Pros: 15 radio-ready pop kits, perfect for pop producers, vocalists or anyone interested in working with current pop chart topping music themes. Cons: No separate MIDI files included with KLI version. Think superstars like Bruno Mars, Post Malone, Daft Punk and Calvin Harris, to name just a few. These are some of the modern pop influences you’ll hear within this expansive collection of well-developed kits. Each version contains over 1,000 patches or loops files, ensuring you’ll find a wealth of pop synths, brass, vocals, bass, synth pads and drums to inspire, influence or speed your hit-making. Kits range from 76 to 132 BPM with a broad assortment of key signatures to work within. 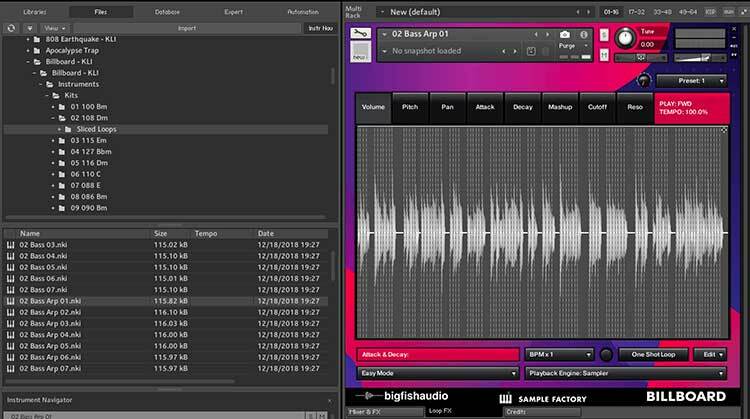 With a long history of developing high quality loops and samples, Big Fish Audio has, once again, teamed with the talented folks at Sample Factory to create Billboard Modern Pop. This team is responsible for some of the strongest material this reviewer has encountered with titles like Trapture: Trap & Hip Hop, Circles Modern Drama Film Scoring and many other titles, this team has earned a reputation for turning out top quality tune-smithing and serious control options for the discriminating producer. It’s hard to imagine that Billboard Magazine has been around since 1894. Before the turn of the century, the publication’s first foray into the music scene was in 1899, when it devoted its print-space to coin-operated “amusement machines.” The vaudeville version of the Jukebox! Suffice it to say, Billboard quickly became synonymous with the hit-makers who climbed its charts. Today, Billboard still remains as the music industry’s yardstick of success, having a “Billboard hit” is what almost every music maker has dreamed of for over 100 years. Enter the recent collection of 15 finely crafted Modern Pop construction kits from Sample Factor together with Big Fish Audio and Billboard Modern Pop lives up very well to its namesake. Think superstars like Bruno Mars, Post Malone, Daft Punk and Calvin Harris, to name just a few. These are some of the modern pop influences you’ll hear within this expansive collection of well-developed kits. Each version contains over 1,000 patches or loops files, ensuring you’ll find a wealth of pop synths, brass, vocals, bass, synth pads and drums to inspire, influence or speed your hit-making. Kits range from 76 to 132 BPM with a broad assortment of key signatures to work within. The product comes packaged in two different offerings, making it attractive to both novice and experienced producers. A KLI version offers a tremendously well-conceived KLI Kontakt instrument for those who prefer it, while Multi-Format purchasers receive the product as Acidized Wav, Apple Loop and REX/RMX file versions. MIDI files are also included with the Multi-Format version of the product, but sadly these are not included with the KLI version. 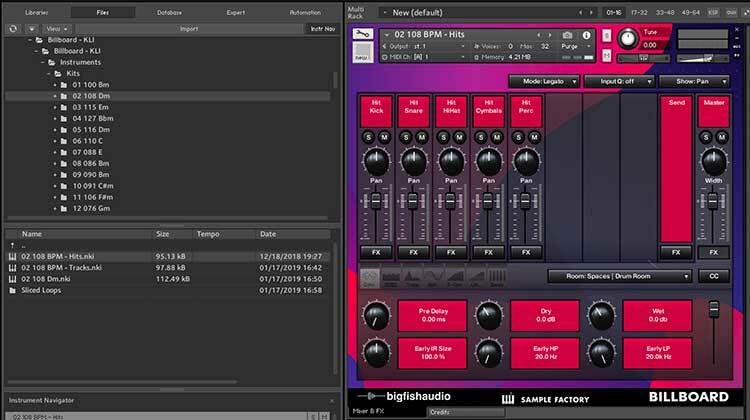 By now, most anyone familiar with Big Fish Audio’s KLI versions, knows the basic set-up and navigation. I’ll breeze through the KLI layout so you can get a feel for trying this if you’re still using Apple loops or Acidized wav files. There’s nothing wrong with either method of working. It simply boils down to your preferred workflow for time and efficiency. Each KLI series includes a DEMO.nki – this is where all the fully mixed versions reside. From the Demo menu, you can preview each track as well as gather track info like key signatures and tempo. You can also see which key on your keyboard, the demo track is mapped to. Moving on, you’ll see that each kit contains a number of instruments named HITS, TRACKS and then the main construction kit instrument. Navigating to the KITS.nki, you can see that each construction kit is labeled with Kit number, Tempo and key signature. This same file-naming system is also used in the Apple Loops and Wav file versions. You’ll never really be lost while navigating through these folders. The HITS.nki instrument merely holds additional percussion or “hits” that can be used to enhance or fully customize the main construction kit. On the right, (shown in green) are the percussion or HITS while the red, white and green keys on the left allow you to pitch the elements up or down. The green key indicates the current pitch position, the red keys shift pitch and the white key resets everything. This is also true of the TRACKS.nki and main construction kits, too. This makes pitch changes easy with no noticeable audio artifacts. The TRACKS.nki contains all the drum tracks and rhythmic elements, allowing you to add your own versions, enhance the main kits or completely rethink the drums for each construction kit. With the main construction kit instrument, pitch shifting up or down is still possible, making it possible to transpose or create alternate versions of tracks and elements easily. It is this area where you can access FX like reverbs, dynamics and other processing to further customize your mix. Moving on to the Sliced loops folder, you can really define your own sound with these kits, simply by using some of the built-in features that sliced loops afford – such as changing playback speeds, loop trigger points and forward or reverse playback. For those curious how Wav or Apple Loops compare to the KLI version, think of it this way: While dragging wav or Apple Loops into place may be faster than say, recording, arranging and colorfully identifying loops as I have for the image below, Apple and Wav file loops would not allow me to key shift and transpose as easily and without artifacts, like the KLI version affords. In the Logic Project pictured below, you can see how each loop is color-coded to indicate its variation and position throughout the song. Here you can see my workflow as the top track (intentionally grayed-out) is meant to serve as a reference track, while all the tracks below that help to recreate the original piece. Is Billboard Modern Pop a good value for you? Only you can decide if you’ll actually use these loops and kits in your productions. The folks at Big Fish Audio have provided a vast amount, of demos, samples and tutorials to help you get the most from this library and I strongly encourage you to explore all the demos to determine if this is money well spent. In summary, I found Billboard Modern Pop to be a very well-designed set of song building kits. With its 15 radio-ready compositions, clever hooks, current instrumentation, poppy lead lines and highly customizable rhythmic elements, there’s plenty to love about this collection. Each kit sounds like a chart-ready single. For singers, there’s plenty of “current” to find inspiration in and for producers wanting ear candy in a hurry, this is a box full of delicious. If you plan to use the KLI version of this product, you must have the FULL version of Kontakt (version 5.8.0 or greater.) The KLI version of Billboard Modern Pop downloads as a compressed file weighted at 3.41 GB. Fully expanded, this version blooms to occupy 5.58 GB of space on your hard drive and offers up 1,013 Kontakt patches. For purchasers of the Multi-Format version, you’ll receive access to 3 formats: REX/RMX, Apple Loops and Acidized Wav files. Rex comes in in the light-weight division, clocking in at just 1.53 GB with a total of 1024 files. Apple and Wav versions are nearly tied for the middle-weight class with Apple edging out Wav files with just a mere 6 more files than the wav version. Apple is 5.37 GB with 1047 files while Wav weighs 5.37 GB with just 1041 files.